A Twitter user reportedly shared a video of a man with a mobile phone inside a polling booth in Hyderabad. AIMIM leader Asaduddin Owaisi urged the police to ensure action against the man in the video. However, the account of the Twitter user was later deleted. Another clash between YSRCP and TDP was reported in Andhra Pradesh, this time in Allagadda in Kurnool. CNN-News18 reported that over 10 incidents of clashes have been reported since the polling began in the state. Telangana recorded 48.95 percent polling till 3 pm across 17 Lok Sabha constituencies of the state where former Union minister Renuka Chowdhury and AIMIM chief Asaduddin Owaisi are among prominent candidates in the fray as voting progessed peacefully. Zaheerabad recorded highest number of voter turnout with 63.39 per cent while Hyderabad, from where Owaisi is seeking re-election, registered 27.79 percent till 3 pm. Telangana and Andhra Pradesh governor ESL Narasimhan, Telangana chief minister K Chandrasekhar Rao, TRS working-president KT Rama Rao, K Kavitha and Asaduddin Owaisi and film actors Chiranjeevi, Ram Charan, Allu Arjun, junior NTR and 'Baahubali' director SS Rajamouli were among the prominent people who cast their vote in their respective constituencies. The family of the late Nandyal MLA Bhuma Nagi Reddy is alleging that two of their supporters were kidnapped by YSRCP leaders in Allagadda constituency. Bhuma Mounika (sister of state minister Akhila Priya) and Jagath Vikyath Reddy (Akhila Priya's brother) have said that they will stage a protest outside YSRCP leader’s house if their supporters don’t come back. “They (YSRCP workers) were carrying sticks in their cars, and throwing stones at us. They also destroyed my car,” said Bhuma Mounika. A YSRCP worker has been hospitalised after he was injured in a clash which broke out between YSRCP and TDP workers at a polling station in Jammalamadugu Mandal of Kadapa district today. 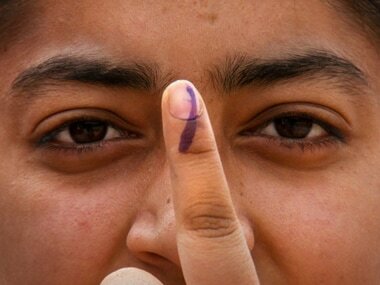 "Hyderabad, Secunderabad, Malkajgiri, Chevella and Nizamabad amongst lowest voters turn out in the Telangana state so far. Irrespective of whoever wins elections, everybody lost public support, confidence and hope," the AAP unit of Telangana tweeted. Dwivedi said there were some glitches in functioning of 381 EVMs which were rectified subsequently. JD(U) vice-president Prashant Kishor accused Chandrababu Naidu of circulating "fake news". "Few hours left for the polling to close but it’s clear that people of AP have decided their verdict. It is time to say #ByeByeBabu," he tweeted. A video has surfaced which allegedly features TDP leaders, who are seen distributing money in Gudivada Assembly seat in Krishna district of Andhra Pradesh. The video shows the leaders referring to a voter list for confirming the identity of voters. They are also seen seeking votes for TDP, and are threatening voters that if they don’t, then next time their votes will be deleted and they would be disallowed from seeking benefits of welfare schemes. The workers are reportedly the aides of state minister Devineni Umamaheswarrao. Delhi chief minister Arvind Kejriwal has retweeted even more claims from people in the southern states claiming that their names were deleted from the voters list. Some voters claimed to have cast their ballots for the Assembly election, but said they were unable to spot their names on the list. Telangana registered over 38 percent polling till 1 pm across 17 Lok Sabha constituencies of the state where former Union minister Renuka Chowdary and AIMIM chief Asaduddin Owaisi are among prominent candidates in the fray. Medak recorded the highest voter turnout at 54 per cent while Hyderabad registered just 20.59 percent till 1 pm. Telangana and Andhra Pradesh Governor ESL Narasimhan, Telangana chief minister K Chandrasekhar Rao, TRS working president KT Rama Rao, K Kavitha and AIMIM chief Asaduddin Owaisi and film actors Chiranjeevi, Ram Charan, Allu Arjun, junior NTR and Bahubali director SS Rajamouli were among the prominent people who cast their vote in their respective constituencies. Several TRS leaders including party working president KT Rama Rao, Nizamabad MP K Kavitha, MLA Balka Suman, state Labour Minister Chamakura Malla Reddy and others noted that they had cast their votes on Twitter. 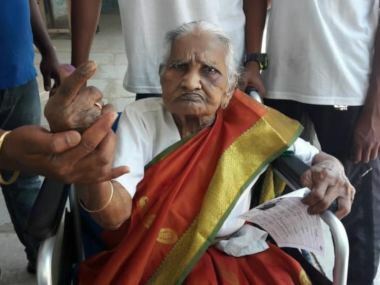 Tarakamma, 105, exercised her right to her vote at Wanaparthy in Kurnool Lok Sabha Constituency. She is the mother of state agriculture minister S Niranjanreddy of Telangana Rashtra Samithi. TDP leader Kodela Siva Prasada Rao was allegedly attacked by YSRCP workers at a polling booth in Sattenapalli. YSRCP chief Jagan Mohan Reddy on Thursday alleged that Chief Minister Chandrababu Naidu had met Andhra Pradesh Chief Electoral Officer Gopalkrishna Dwivedi on Wednesday night at the Secretariat at Velagapudi, further alleging that the TDP leader had threatened the CEO. In response to the allegation, TDP released a video of the meeting. According to the video, Chandrababu lodged a protest witht the Election Commission, alleging that the poll panel was being biased towards YSRCP. After questioning the CEO about recent transfers of state officials, Dwivedi said Andhra Pradesh Chief Secretary Anil Chandra Punetha, DG (Intelligence) AB Venkateswara Rao and a few others district SPs had been transferred only after the Opposition's complains were looked into. Below is a video of Chandrababu's meeting with the EC, released by TDP in the aftermath of YSRCP's complaints. Telangana chief minister K Chandrashekar Rao and his wife cast their votes for the Lok Sabha election at a polling booth in Siddipet district. Visuals from Guntur district’s Inumella village in Sattenapalli Assembly constituency shows a man reportedly identified as the current Speaker of the Legislative Assembly. Kodela Siva Prasada Rao, being administered care after allegedly being attacked by YSRCP workers while inspecting the booth. Rao is contesting from the Narasaraopet Assembly seat. Congress MP Shashi Tharoor campaigned on foot in Parassala, on the outskirts of Thiruvananthapuram. He then tweeted about the "spectacular turnout" from rural constituents. Amid reports of escalating violence among TDP and YSRCP workers across Andhra Pradesh comes news of the death of two members of each party in a bloody clash in Anantapur constituency of Andhra Pradesh. Two people were injured in the clash, one of whom can be seen being brought out of the hospital, after receiving preliminary treatment. Clashes in Anantapur Lok Sabha constituency have resulted in the death of TDP leader Bhaskar Reddy and a YSRCP worker Pulla Reddy at the polling station of Veerapuram village in Tadipatri mandal. Two others are reportedly in a critical condition. The working president of Telangana Rashtra Samithi, KT Rama Rao, has cast his vote at a polling booth in Hyderabad. He is TRS chief K Chandrashekhar Rao's son. "I am hopeful that we will be able to win this race, I am very optimistic," said Khammam's Congress candidate Renuka Chowdhury, after casting her vote. Delhi chief minister and Aam Aadmi Party chief Arvind Kejriwal joined the many voices alleging that voter names have been deleted across India. He retweeted Biocon chairperson Kiran Mazumdar Shaw's claim that her mother's name had been deleted (before the polls began) on a flimsy claim. Andhra Pradesh chief minister Chandrababu Naidu said 30 percent of the EVMs in the state are not working, however the Election Commission held otherwise. "Some news channels are reporting that 30 percent of the EVMs are not working, which is not correct. In total, we have 45,959 booths, and we are using around 92,000 EVMs, out of which we have got 344 issues and 25 are still pending" said Gopalakrishna Dwivedi, Andhra Pradesh chief electoral officer. TDP cadres on Thursday beat up the YSRCP polling agent at Puthalapattu polling station in Chittoor district. Reports of widespread violence across the state, which has simultaneous Lok Sabha and Assembly polls, have been increasing in number as the day progresses. Two women voters were injured as TDP and YSRC workers pelted stones at each other at Jammalamadugu in Andhra Pradesh’s Kadapa district. Telugu cinema director SS Rajamouli tweeted that half of his unit members had left for the towns and villages across Andhra Pradesh and Telangana and urged people to vote. Shobana Kamineni, vice-chairperson of Apollo Hospitals, found her name missing from the voters’ list at a polling centre in Masab Tank in Hyderabad, where she has been voting for years. Her name was in the voters' list when she checked last week. She returned to India from a business trip only a day ago, just to vote. “I feel cheated as a citizen. Does my vote not count?” she asked. Andhra Pradesh chief minister Chandrababu Naidu has demanded that repolling be done at places where EVMs did not work. "Thirty percent of the devices malfunctioned and as a result, polling started up to three hours late in many places," said Naidu. Clashes between TDP and YSRCP party workers are being reported from various places in AP. Polling equipment was destroyed in Srinivasapuram village in Guntur's Gurazala mandal, in a fight between opposing party workers. In another brawl in Gudemcheruvu village in Jammalamadugu (Kadapa district), a YSRCP worker was injured. In a stone-pelting incident between opposition party workers in Ponnathota of the same mandal, a few people were injured. Similar news is coming in from Mydukur constituency. Southern star Allu Arjun, after casting his vote in Hyderabad, said, "Today is that one day which will decide how the next 1,825 days should be, please cast your vote." "Imran Khan has no right to interfere in the electoral process of India. We have free and fair elections in India. Kashmir kisi kay baap ka nahii hai, vo Hindustan ka hissa hai," AIMIM chief Asaduddin Owaisi said, after casting his vote on Thursday. Pakistan prime minister Imran Khan had said on Wednesday that Pakistan and India would have a better chance at coming at a conclusion through peace talks on Kashmir, if the BJP came back to power. All India Majlis-e-Ittehadul Muslimeen chief and Hyderabad MP candidate Asaduddin Owaisi cast his vote at a polling booth in the city. Voter turnout recorded till 9 am in Telangana was 10.6 percent, reported ANI. "Even technologically advanced countries are not using EVMs. I have been fighting against EVMs for long. A voter doesn't get the satisfaction of voting through ballots when they are voting on EVMs. They don't ensure transparency. EVMs are not correct for the voting process. Today, there are reports of EVM malfunctioning from many booths," said Andhra chief minister Chandrababu Naidu in the wake of severe failure of EVMs across polling booths, early in the Phase 1 of polling. Ironically, Andhra Pradesh Chief Election Officer Gopala Krishna Dwivedi was unable to cast his vote at Tadepalli Assembly constituency in Guntur district due to malfunctioning EVMs. Reports are coming in that people are leaving polling booths without voting returning home. 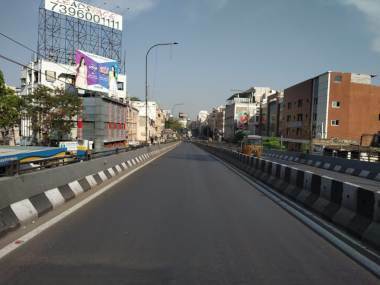 Lakdi ka pul Centre and Narayanaguda flyover in Hyderabad both wore deserted looks as many residents travelled down south to Andhra Pradesh to cast their votes. 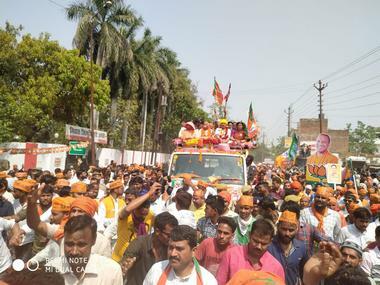 Lakhs of voters from across Telangana travelled south over the past two days, braving traffic snarls along the highway, overcrowded trains and buses. Kavitha, who is KCR's daughter, tweeted after casting her vote in the polls. She is significantly going up against 179 farmers. Telangana Rashtra Samithi's K Kavitha, the daughter of state chief minister K Chadrashekhar Rao, has cast her vote at a polling station in Pothangal, in Nizamabad parliamentary constituency. Kavitha, significantly, has gone up against 184 candidates, creating a record in India's election history. Andhra Pradesh police has defused an IED planted by Maoists on the way to the Peddabailu polling station in Visakhapatnam district, say unconfirmed reports. The area is on high alert. All booths in Paderu, Araku and Rampachodavaram have been declared very sensitive. 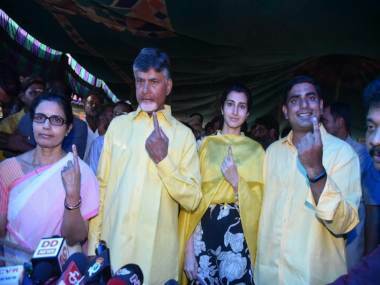 Andhra Pradesh chief minister Chandrababu Naidu, his wife Bhuvaneswari, their son and IT minister Nara Lokesh with his wife cast their vote at a Mangalagiri booth. The chief electoral officer of Andhra Pradesh has shared photos of two model polling stations in Kakinada city. The booths are managed by women, who are also executing the roles of webcaster, videographer and superviser. TDP MP and the party's candidate from Vijaywada, Kesineni Srinivas, has cast his vote at St Joseph Girl's High School in Vijaywada. Simultaneous Assembly and Lok Sabha voting has been delayed at several places in Andhra Pradesh due to malfunctioning EVMs. Voters have been standing in queues in several sites to elect representatives to 175 Assembly and the 25 Lok Sabha seats in in the state. The fate of 2,395 Assembly and 344 Lok Sabha candidates will be decided by over 3.6 crore voters in the state. Chandrababu Naidu has cast his vote at Amaravati. He was accompanied by his whole family. Polling in Jammalamadugu in Andhra’s Kadapa district (and constituency) is a non-starter even an hour after voting has started elsewhere. The delay is mainly due to technical issues concerning EVMs, said poll officials. The constituency has been witnessing bloody feuds between rival groups of the TDP, its workers and leaders. One of the region's biggest politicians, P Ramasubba Reddy, has traditionally been with the TDP, while his other power -- the state's marketing minister C Adinarayana Reddy -- has recently defected to TDP from YSRCP. Adinarayana is now seeking election from Jammalamadugu, something Ramasubba loyalists are extremely unhappy about. Voters in Amaravati constituency of Andhra Pradesh have turned up in large numbers at polling booths already. Andhra Pradesh chief minister N Chandrababu Naidu on Wednesday staged a protest in front of Chief Electoral Officer Gopal Krishna Dwivedi's office at Amaravati to protest against what he called "illegal and unethical" Income Tax raids on his party's leaders. "I am asking the Income Tax department who are they to do only one side raids, only one political party, Telugu Desam Party (TDP). When elections around, it is level playing field automatically they have to treat everyone equal. You have to get information then only go for raids otherwise if you do these type of things it is unjustifiable, incorrect, illegal and unethical," Naidu told reporters after the meeting. He has been asked to furnish his reply by 12 April evening, failing which the Commission will take a decision "without any further reference to you". The Commission said VHP state president M Rama Raju had filed a compliant which claimed that the Telangana Rashtra Samithi chief "tried to secure votes by passing derogatory remarks against Hindus while addressing an election rally at Karimnagar on 17 March." The Election Commission on Wednesday night appointed Ashutosh Shukla, the present DGP, prisons, as Director General of elections. He will supervise all poll related work involving police in Tamil Nadu with immediate effect. Of the total 46,120 polling stations, 8,514 have been classified as critical and 520 as Left Wing Extremism-affected. The original timing of voting (7 am to 6 pm) may differ in these areas. In Andhra Pradesh, where voters will be casting votes simultaneously for the Parliamentary election and the Assembly election, many have already populated polling booths. In Telangana, all 17 Lok Sabha constituencies will go to polls on Thursday. As many as 443 candidates (418 male and 25 female) candidates are in the fray in the 17 constituencies. Over 2.97 crore voters, including 1504 transgenders, are eligible to exercise their franchise in the state, which has a total of 34,604 polling stations. 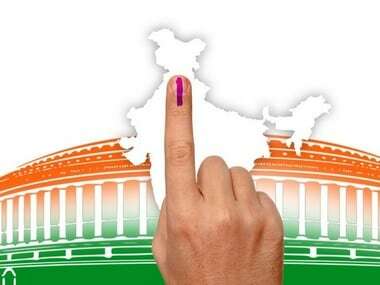 Polling will be held from 7 am to 4 pm in 13 LWE-affected Assembly segments under five parliamentary constituencies, and from 7 am to 5 pm in all other Lok Sabha constituencies. Voters have already joined the queues as Phase 1 of polling begins in Andhra Pradesh's 25 seats. The state will also see simultaneous Assembly polls. This is the first general election in the state after bifurcation of Andhra Pradesh and creation of Telangana in June, 2014. A day before his state went into polls, Andhra Pradesh chief minister N Chandrababu Naidu took to Twitter to urge voters to exercise their basic constitutional duty. There are a total of 3,93,45,717 registered voters in Andhra Pradesh, including 1,94,62,339 male, 1,98,79,421 female and 3,957 transgenders. Of the total, 10.15 lakh are first-time voters in the 18-19 age group. As many as 319 candidates are in the fray for 25 Lok Sabha seats in the state. Voting in Andhra Pradesh will take place between 7 am and 6 pm except for Araku Lok Sabha seat, where votes will be cast in Kurupam, Parvathipuram, Sailur, Rampachodovaram constituencies between 7 am and 5 pm. In Araku seat, Araku Valley and Paderu will see voting between 7 am and 4 pm. This is the first general election in the state after bifurcation of Andhra Pradesh and creation of Telangana in June 2014. In the first phase of Lok Sabha election, polling will be held in 91 out of 543 Lok Sabha constituencies, spread over 20 states and Union Territories on Thursday. 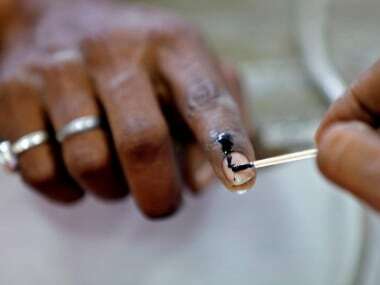 In southern India, the states that will go to polls on Thursday are Andhra Pradesh and Telangana. In Andhra Pradesh, Assembly polls to 175 seats will also be held in the same phase. A clash broke out between workers of TDP and YSRCP at a polling station in Srinivasapuram Village of Gurajala Assembly constituency in Guntur district. Actors Naga Chaitanya and Samantha cast their votes at a polling station in Nanakramguda of Gachibowli. Watch as Kalavakuntla Kavitha, reigning MP of Nizamabad, tells Chandramukhi Muvvala what makes the problems of her constituency unique and why national parties have never understood them. Nizamabad is at a curious juncture, with 185 candidates in the fray, among whom are 179 farmers who are protesting against the government's apathy to their condition. Jana Sena MLA candidate Madhusudhan Gupta smashed an EVM at a polling booth in Gooty, in Anantapur district, and was arrested by police. South States Lok Sabha Election Voting LATEST updates: Telangana recorded 48.95 percent polling till 3 pm across 17 Lok Sabha constituencies of the state where former Union minister Renuka Chowdhury and AIMIM chief Asaduddin Owaisi are among prominent candidates in the fray as voting progessed peacefully.Andhra Pradesh recorded 55 percent voter turnout till 3 pm. In a letter to Andhra Pradesh Director General of Police (DGP) RP Thakur, TDP president and Chief Minister N Chandrababu Naidu stated that the polling agents of YSRCP were resorting to violence and obstructing the polling process. Meanwhile, fresh clashes were reported in Guntur between TDP and YSRCP workers at a polling booth. Telangana chief minister K Chandrashekar Rao and his wife cast their votes for the Lok Sabha election at a polling booth in Siddipet district. The working president of Telangana Rashtra Samithi, KT Rama Rao, has cast his vote at a polling booth in Hyderabad. He is TRS chief K Chandrashekhar Rao's son. Reports of voter name deletions have been coming from across Telangana. Shobana Kamineni, vice-chairperson of Apollo Hospitals, found her name missing from the voters’ list at a polling centre in Masab Tank in Hyderabad, where she has been voting for years. Kamineni is former Confederation of Indian Industries (CII) chief and the daughter of Apollo Hospitals' head Dr Pratap Reddy. Her name was in the voters' list when she checked last week. She returned to India from a business trip only a day ago, just to vote. “I feel cheated as a citizen. Does my vote not count?” she asked. Clashes between TDP and YSRCP party workers are being reported from various places in Andhra Pradesh. Polling equipment was destroyed in Srinivasapuram village in Guntur's Gurazala mandal, in a fight between rival party workers. In another brawl in Gudemcheruvu village in Jammalamadugu, a YSRCP worker was injured. In a stone-pelting incident between opposition party workers in Ponnathota of the same mandal, a few people were injured. Similar news is coming in from Mydukur constituency. Arguably, the biggest news emerging out of Andhra Pradesh is the failure of EVMs in several polling booths. State chief minister Chandrababu Naidu has demanded that repolling be done at places where EVMs did not work. "Thirty percent of the devices malfunctioned and as a result, polling started up to three hours late in many places," said Naidu. All India Majlis-e-Ittehadul Muslimeen chief and Hyderabad MP candidate Asaduddin Owaisi cast his vote at a polling booth in the city. "Imran Khan has no right to interfere in the electoral process of India. We have free and fair elections in India. Kashmir kisi kay baap ka nahii hai, vo Hindustan ka hissa hai," AIMIM chief Asaduddin Owaisi said, after casting his vote on Thursday. Voters queued up in considerable numbers at polling stations even as EVMs registered glitches resulting in some delay in polling, an official said. Ironically, Andhra Pradesh Chief Election Officer Gopala Krishna Dwivedi was unable to cast his vote at Tadepalli Assembly constituency in Guntur district due to malfunctioning EVMs. Reports are coming in that people are leaving polling booths without voting returning home. Telangana Rashtra Samithi's K Kavitha, the daughter of state chief minister K Chadrashekhar Rao, has cast her vote at a polling station in Pothangal, in Nizamabad parliamentary constituency. Kavitha, significantly, has gone up against 184 candidates of whom 179 are farmers, creating a record in India's election history. In the wake of reports of faulty EVMs coming from across Andhra Pradesh, chief minister Chandrababu Naidu reiterated his demand for replacement of EVMs with paper ballots, leading the Opposition’s charge against the voting machines. YSR Congress Party Chief Jagan Mohan Reddy said after casting his vote in the Kadapa constituency of Andhra Pradesh that he was very confident. "People are looking for a change, vote without fear," he told reporters. Andhra Pradesh chief minister N Chandrababu Naidu and his chief rival, YSRCP chief Jaganmohan Reddy, both cast their votes in the early hours of Phase 1 of the polls. While Naidu voted for the simultaneous polls at Amaravati, Jaganmohan voted at Pulivendula. Andhra Pradesh chief minister N Chandrababu Naidu, who on Wednesday staged a protest in front of Chief Electoral Officer Gopal Krishna Dwivedi's office at Amaravati against what he called were "illegal and unethical" Income Tax raids on his party's leaders, on Thursday appealed to voters to remember their constitutional duty and exercise their franchise. Nizamabad Lok Sabha constituency is a special case in this election as 185 candidates, including more than 170 farmers, are in the fray. The peasants have entered the fray to highlight their demand for remunerative price to turmeric and red jowar. Polling in Nizamabad is likely to begin at 8 am and end at 6 pm as mock polling is expected to take more time compared to other constituencies in view of the large number of candidates. In the first phase of Lok Sabha election, polling will be held in 91 out of 543 Lok Sabha constituencies spread over 20 states and Union Territories on Thursday. In southern India, the states that will go to polls on Thursday are Andhra Pradesh and Telangana. There are a total of 3,93,45,717 registered voters in Andhra Pradesh, including 1,94,62,339 male, 1,98,79,421 female and 3957 transgenders. Of the total, 10.15 lakh are first-time voters in the 18-19 age group. As many as 319 candidates are in the fray for 25 Lok Sabha seats in the state. Of the total 46,120 polling stations, 8,514 have been classified as critical and 520 as LWE-affected. Arrangements have been made for video recording of the polling process in all places, while webcasting would be done from about 28,000 polling stations. A total of 197 companies of Central Armed Police Force have been deployed across the state in addition to 51,525 state police personnel, 60 companies of AP Special Police, 4,500 Karnataka and 736 Odisha police for security. The total number of security personnel deployed is 1.20 lakh. As many as 145 companies of central paramilitary forces and 9,000 policemen from other states have been deployed, in addition to more than 55,000 state police for security arrangement.